Tokyo, November 21, 2013 - Fuji Heavy Industries Ltd. (FHI), the maker of Subaru automobiles,today announced that the all-new Subaru WRX (US specifications) has made its world premiere at the 2013 Los Angeles Auto Show being held at the Los Angeles Convention Center. The product concept for the all-new WRX is "Pure Power in Your Control". Reigning in the intense power and superior environmental friendliness of the 2.0-liter Horizontally-Opposed direct injection turbo "DIT" engine with a body and chassis thoroughly stiffened, the new WRX has drivers rejoicing at the free reign they have over this high-powered machine. Also,along with the standard six-speed manual transmission, Sport Lineartronic has newly been adopted to the transmission. In addition to smooth shifting mode, the Sport Lineartronic comes with an eight-speed manual shift mode with sharp shifting response, allowing more drivers to enjoy a spirited drive. Equipped with a Symmetrical AWD (All-Wheel drive) system built around Subaru's Boxer engine, the WRX is the symbol of Subaru AWD sport performance. 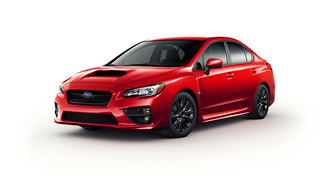 Ever since the first model hit the streets back in 1992, the WRX has gained worldwide support from sports car enthusiasts as a distinctive sports sedan combining impressive sport performance with the practicality of a four-door sedan. The product concept "Pure Power in Your Control" was established during development of the new WRX. This concept aims to reach an even higher order of "absolute speed" and "driving excitement" for sports sedans, the goal pursued in successive generations of WRX models.This product concept was embodied to maximize the potential of the turbo Boxer engine and the pursuit of ultimate control performance, allowing drivers to steer the vehicle exactly as they imagine. To this end, the body has been made lighter and more rigid, integrating extensive chassis reinforcements. The WRX is equipped with a new high performance 2.0-liter Horizontally-Opposed direct injection turbo "DIT" engine for high power with environmental friendliness. This is the first time a manual transmission has been paired with the DIT Boxer engine.Also, the new optional Sport Lineartronic provides greatly improved shift response for a sportier ride than the existing Lineartronic applied for higher torque. This offers more drivers excellent environmental friendliness to go along with real sports driving excitement. Befitting of Subaru's flagship performance model, the WRX exterior presents a performance all-wheel drive car with aggressive yet refined styling. 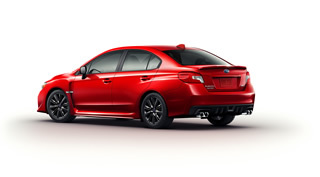 The rear design further enhances the WRX's appeal as a performance model. The diffuser-integrated bumper and twin dual mufflers emphasize the low center of gravity and driving performance. Specially designed rear combination lamps were given a thin shape to highlight vehicle width. A small rear spoiler also enhances aerodynamic performance. The WRX interior is all about high performance. The driver's seat was designed to be like a cockpit̶the moment the driver opens the door, they get transported miles from their daily life. As a symbol of the racing spirit, a silver ring engraved with the letters "WRX" rests around the shift lever on manual models.